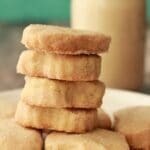 We start off with a simple shortbread cookie dough, I adapted our recipe for vegan shortbread cookies. We make up the dough and then roll it into balls. Some recipes advise chilling the dough first, but I found it almost impossible to put the thumbprint into the chilled dough without it cracking terribly. 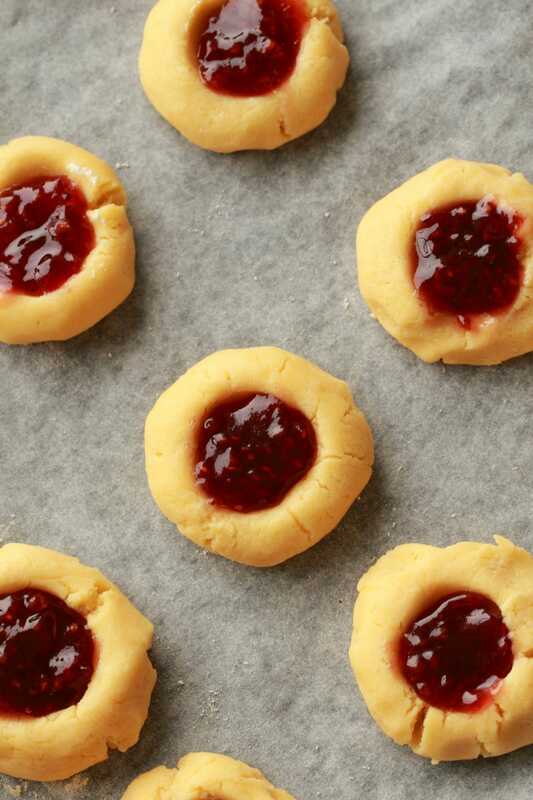 I found it easiest to put a thumbprint into pliable dough and then chill it afterwards before adding the jam. 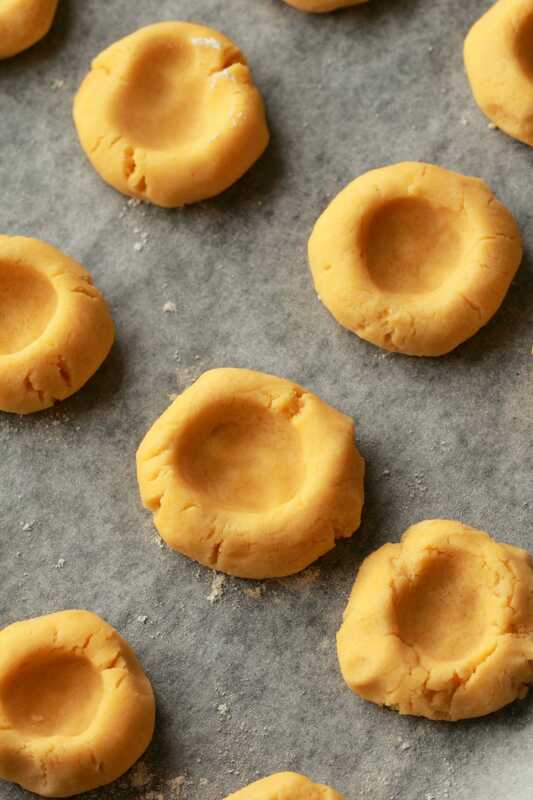 So roll the dough into balls and then use your thumb to make indentations into each ball. 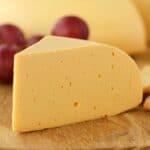 It will crack a little, just smooth it as best you can with your fingers and don’t worry too much about it. Then you place the tray into the freezer to chill for 15 minutes. 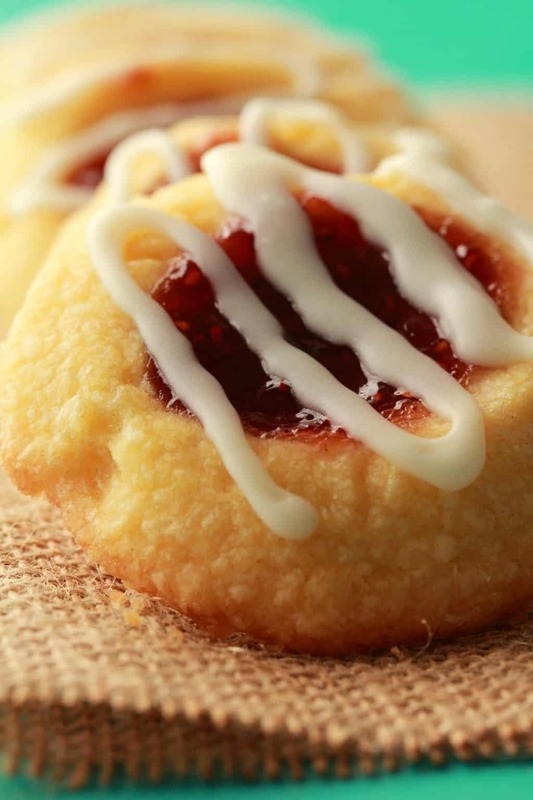 Then you use a teaspoon to add the jam into the thumbprint indentations and smooth it down. Bake in the oven for around 16 minutes. You want the edges of the cookies to be just slightly browned. 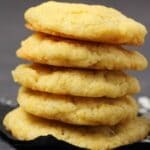 It’s quite different to regular shortbread cookies in this respect because regular shortbread is hard and crunchy, whereas these cookies are soft and crumbly. 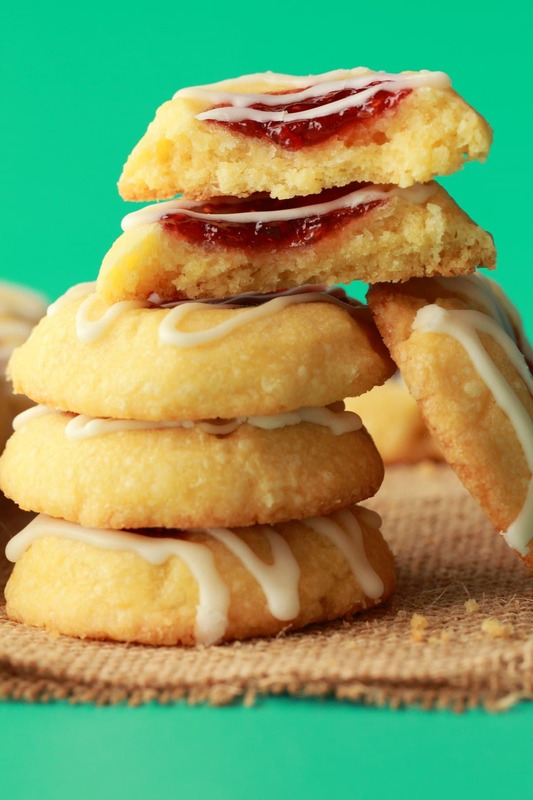 This is why regular shortbread cooks at a lower temperature for a longer time period, whereas this cooks for a much shorter time at a lower temperature. 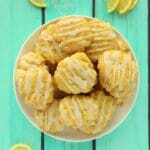 Allow to cool completely before drizzling with a simple glaze of powdered sugar, non-dairy milk and just a drop of almond extract. 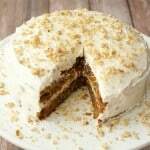 You want just a hint of almond flavor, nothing overpowering. I used raspberry jam, but I have also made a batch with mixed berry jam that was just as fabulous. So use any jam you fancy or whatever you have on hand. Getting the right consistency for the glaze can be a bit tricky because 1 tablespoon of non-dairy milk is too little and 2 tablespoons is way too much. So you have to add 1 tablespoon and then single drops until you get it just right. 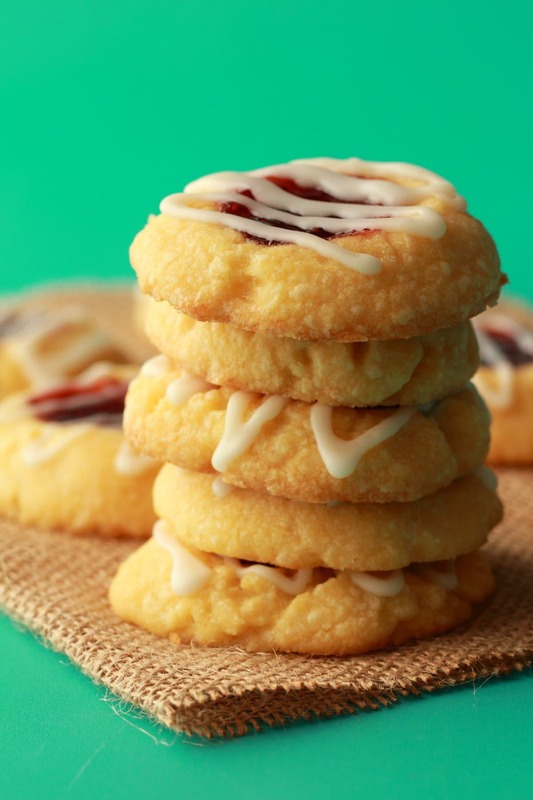 If your glaze is too runny, it will slide right off your cookies, but if it’s too thick, it won’t drizzle on at all. We actually found it quite useful to use our piping kit to put this on, just using the thinnest attachment to pipe it in a drizzle pattern. Keep the cookies in an airtight container where they will stay fresh for a few days or covered in the fridge where they will stay good for up to a week. 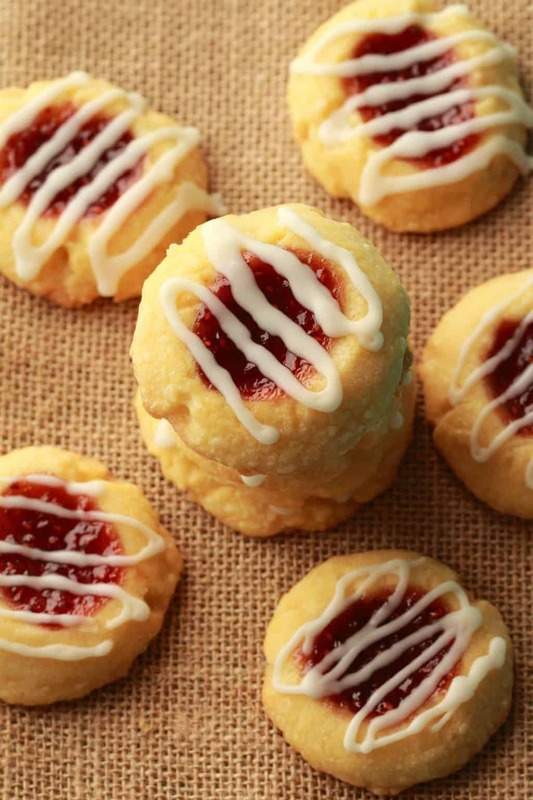 What do you think of these vegan thumbprint cookies? Tell us in the comments and please rate the recipe too, it’s super helpful for us! Thank you! Sign up to our email list for a free and fabulous recipe ebook and to stay updated with all our latest recipes posted to the blog. 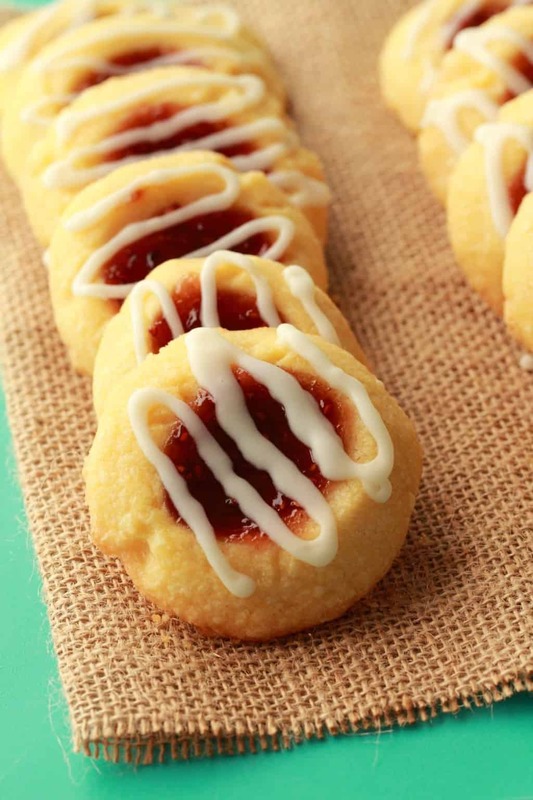 Soft and buttery vegan thumbprint cookies with a raspberry jam center and almond glaze. 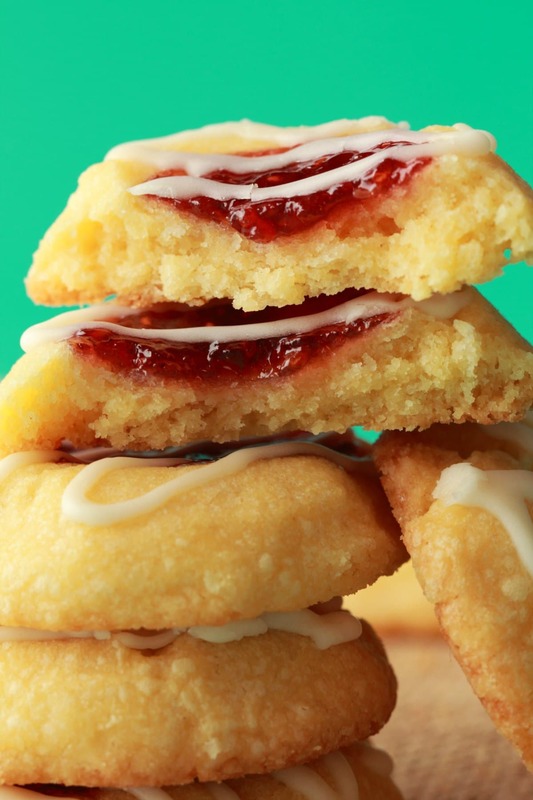 These perfectly sweet melt-in-your-mouth shortbread cookie delights are so easy and fun to make and simply gorgeous! Add the vegan butter and sugar to an electric mixer and cream them together. Then add in the almond extract and mix in. Add in the flour and salt and stir in by hand until it forms a thick dough. 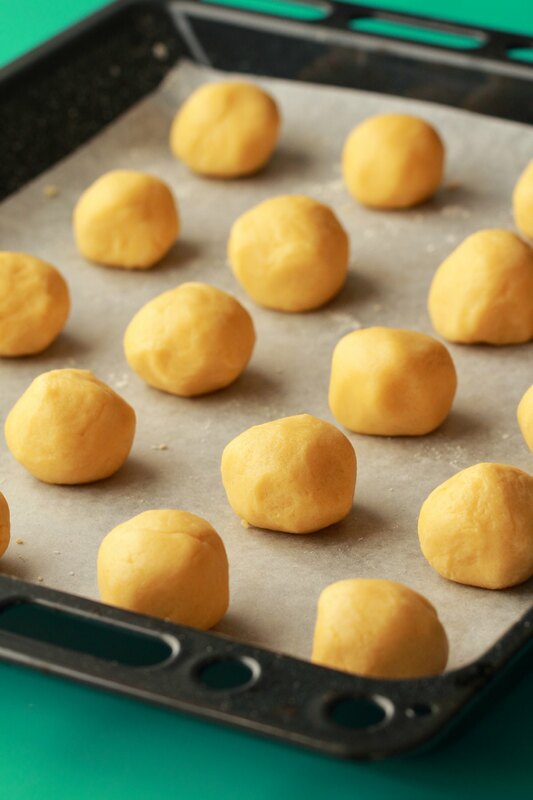 Line a baking tray with parchment paper, and break off pieces of the dough, roll into balls and place the balls onto the tray. 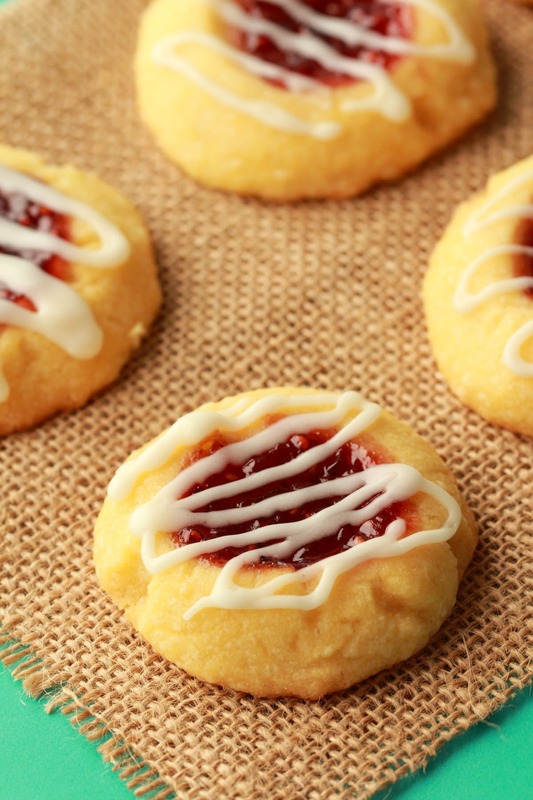 Use your thumb to create thumbprints in the balls, the dough may crack along the edges, just use your fingers to try to smooth out the cracks as best you can. Try and get the thumb indents as uniform as possible. 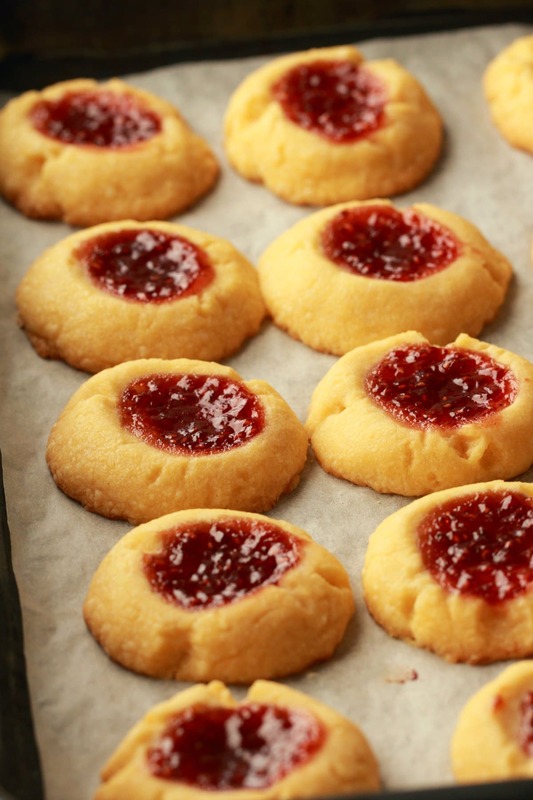 Place the tray with the cookies into the freezer for 15 minutes so that the cookies can firm up before filling the indents with jam. 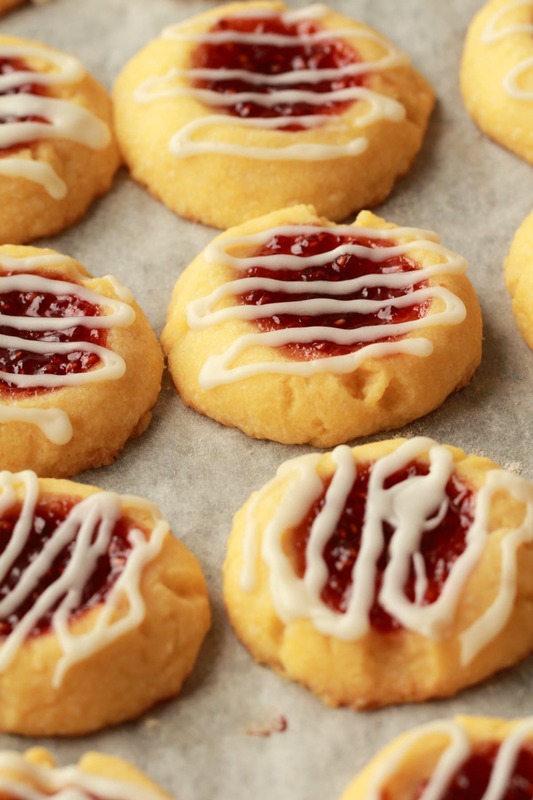 After 15 minutes bring out the tray, preheat the oven to 350°F (180°C) and fill the thumbprints with raspberry jam. Bake in the oven for 16 minutes until the edges of the cookies are slightly browned. Let them cool for at least 30 minutes before glazing. 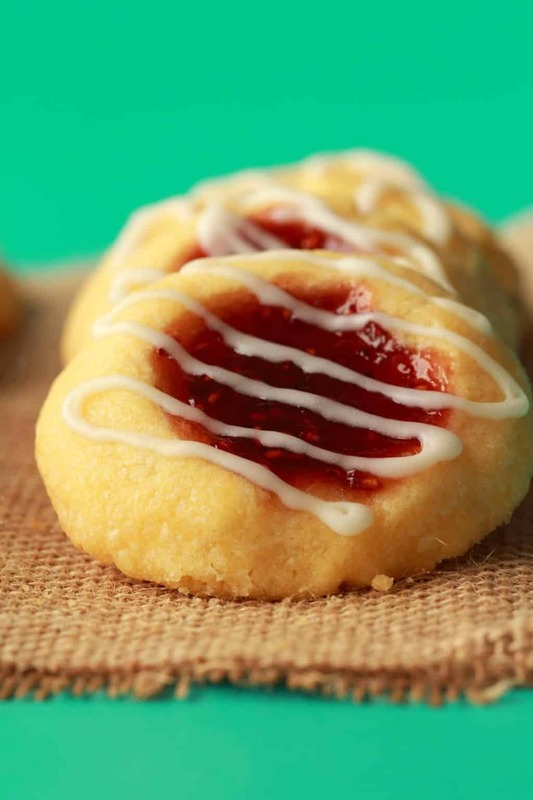 For the glaze, add the powdered sugar, soy milk and a drop or two of almond extract (just enough to get the flavor but nothing overpowering) to your electric mixer. A tablespoon of soy milk is too little, so you need just a few extra drops of soy milk to get the right amount. 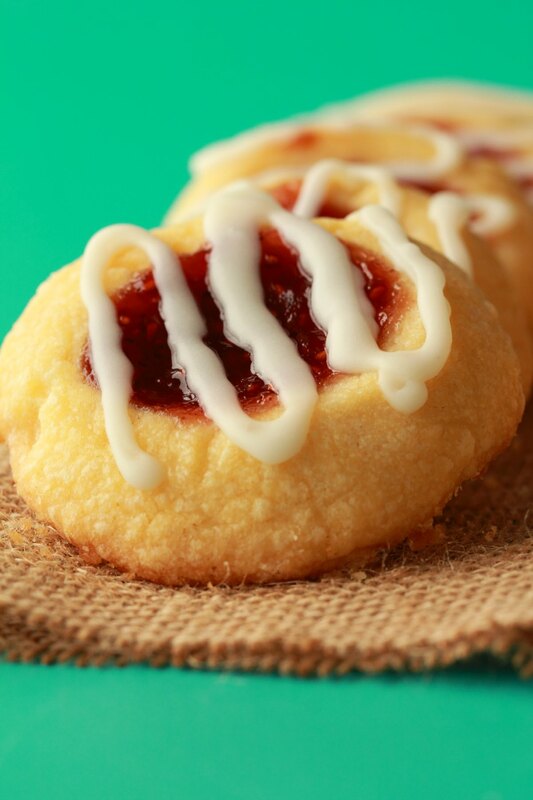 Drizzle the glaze over your cooled cookies, or use a piping bag to pipe it on. 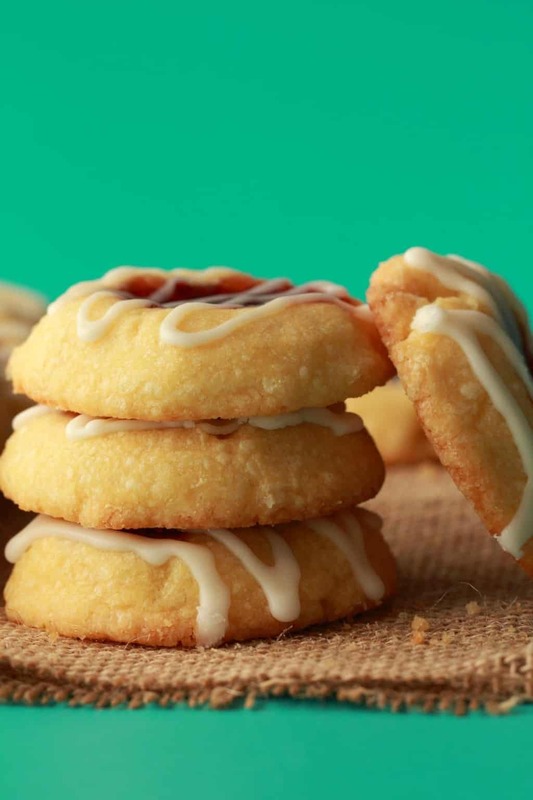 *The almond extract flavor is subtle and adds charm 🙂 – but it can also be omitted if it’s not an appealing flavor blend to you. *Feel free to use a different flavor jam. Thank you for another great recipe! 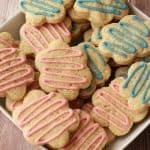 I made these last night, and the cookies were outstanding! I did not use any glaze on them, I thought they were perfectly sweet without it. I did not have almond extract, so I used 1/8 tsp vanilla extract instead. I tried some of them with raspberry jam, and some with blackberry jam, both were very good. 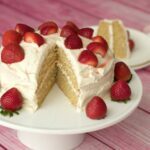 Really simple and easy to make, soft, moist, and delicious. They were a huge hit with my family. 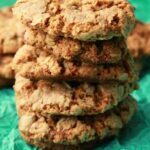 Do you know if I could try these with another kind of flour, such as spelt or gluten free? Also, could I use a healthier kind of sweetener, such as honey or maple syrup? These were amazing!! I cook and bake for my daughter who’s vegan (I’m vegetarian) they were easy to make and really really yummy!! If I didn’t know they were vegan I would not have been able to tell! Bravo for another great recipe! I LOVE this blog!!! Thank you! 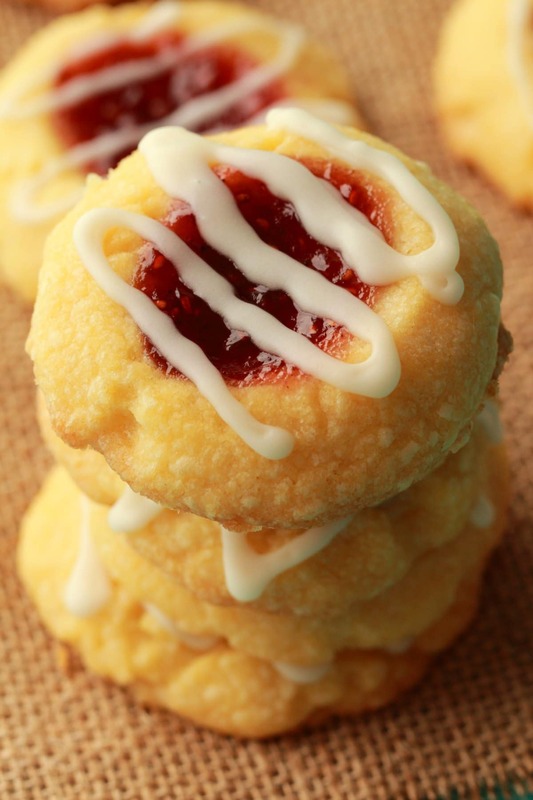 I have never made shortbread before, but I made these today since I had homemade thimbleberry freezer jam to use up. i found the dough a bit crumbly so I just added another Tablespoon of vegan butter and they were perfect. 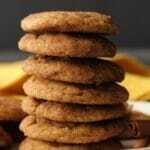 I made 1/2 recipe which made 7 large cookies. The glaze was really a nice addition. 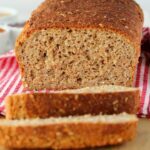 Thank you for the recipe – it is DEFINITELY a keeper for me and I can’t wait to make more of these closer to the holidays as I know they’ll be a huge hit. They taste awesome! I used vanilla extract and blueberry jam instead. Quick, easy, and tasty! I used self raising flour and it was fine. Slightly too salty for my taste so I’ll reduce that next time. I used seedless bramble preserve and was a bit over generous so it leaked over the sides! Off to search more of your recipes now! Great recipe! 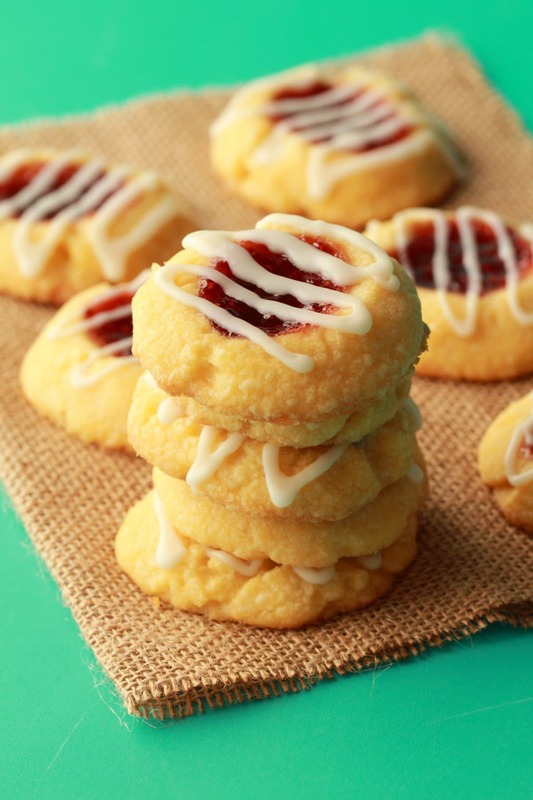 We Just made these for thanksgiving with a homemade cranberry chutney-type filling. soft and “buttery,” perfect for my non-vegan family. Personally; they look a little pale (the bottoms are nice and golden), might try some whole wheat flour next time. These are GREAT! We used vanilla instead of almond. I am a home canner and used my own blackberry jam with no glaze! 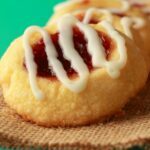 I’ve been searching for a great vegan shortbread! We will use this recipe time and time again! Hello, is the butter used softened to room temp or is it cold. Hi Pam, I usually add it to the mixer cold from the fridge and don’t soften first but it is creamed with the sugar so softens and comes up to room temperature during that process. Just did these and they turned out great! Raspberry jam. Liked the saltiness. Will spread the good cheer at work tomorrow and make fresh ones the 25th! Can I just leave out the almond extract if I’m allergic to nuts and what if I cant get vanilla extract to replace it… can i use lemon juice instead??? What step do you need to preheat the oven?